It’s 1889. Wealthy Eastern Financiers are betting that the Colorado Gold Rush will pay off for them. The placer deposits near the banks of the San Miguel River and Dolores River are promising, but miners are unable to divert enough water to make the claim profitable. Nearby, the San Miguel River and Dolores River possessed the volume of water necessary to provide enough pressure for a successful hydraulic mining endeavor. Although these rivers were relatively close to the Bancroft mining claim, they flowed just out of reach. They say necessity is the mother of invention but perhaps greed joins the family as well . . . either way, people do some crazy things. Really crazy things. It isn’t to say that the idea of building a flume was so crazy. Flumes for placer mining were common at the time. Flume construction methods had been used in California for years and required only minimal skills. To cross arroyos and washes, water could be funneled through flume boxes supported by trestles. But in the canyons of the Dolores and San Miguel Rivers, minimal engineering skill was not enough. This flume would have to be ten miles long, and to complete the entire route at the proper gradient, the Flume would have to cling to seven miles of sheer rock walls, at times suspended hundreds of feet above the river. 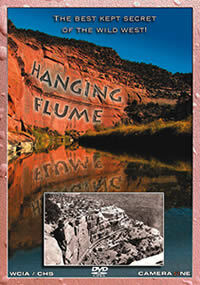 The Hanging Flume is perhaps one of the most risky and lofty plans in mining history . . . and for the purposes of placer mining, pretty much a complete failure. But as a heritage tourism site, it still holds our attention, long after the memory of its father, the mysterious Nathaniel P. Turner and hundreds of grunt workers have faded. Recent preservation efforts promise that we will enjoy the Hanging Flume for generations to come. from the Colorado Historical Society.